I seem to have a strong pull lately, towards making stuff. The trouble is; I’m not good at making and doing unless it involves copious amounts of flour, sugar, butter, chocolate and eggs. I see beautiful creations all the time and I experience a mad rush of jealousy. I want that and why can’t I make that? 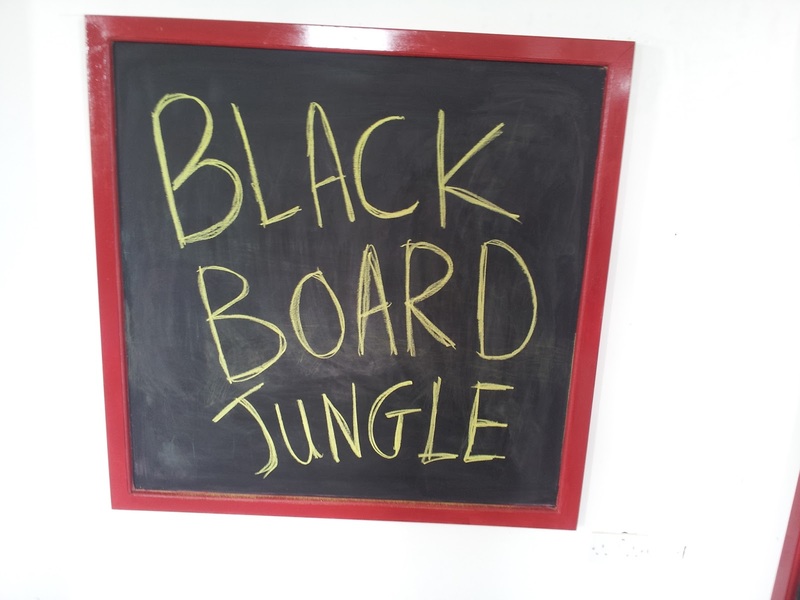 But this time I took that can’t and I made, well, I made two blackboards. Okay, I had help. A lot of help. If you are of a mind to try it yourself, here is a list of the ingredients and our method. You will need a large sheet of plywood cut in two. Mister Husband is a great fan of a timber yard in Carlow so he went and bought one for €23. On the way home he stopped off at a *DIY store and picked up a tin of black board paint. This cost €19.29 and something to paint it on with. The paintbrush cost €6.29. The total of this shop was €48.58. Some miscellaneous but equally important stuff handy to have include fine sandpaper, a sanding block, some filler, screws and a drill. Oh, and a man. You know, to make the tea! What did you think I meant? Girl, go get your equality groove on! 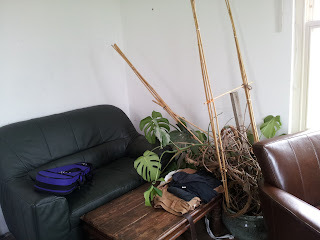 To make it a bit more interesting and because I want to show off a bit, I am going to provide some pictures. This is the warmest, brightest, most welcoming room in the house, despite the clutter. Or maybe because of! The boys converge here all the time to use the computer, to play, to fight and I use it as my downstairs baby change area! 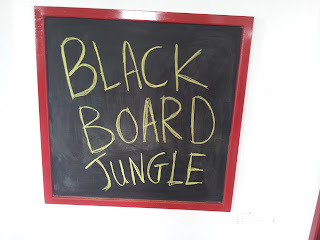 It is also where I reckoned the blackboards should live. It doesn’t look like it but this is going to be a blackboard. 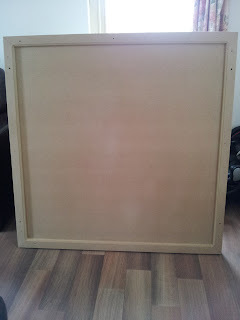 Mister Husband used his tools and his know how to cut the sheet of ¾ inch MDF (Medium Density Fibreboard. Well, you asked!) in half. 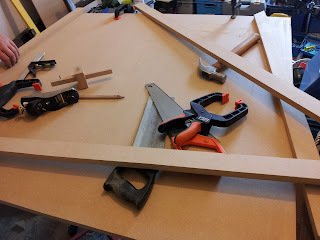 The frame was made by cutting a two inch strip off each side and screwing these to the board. 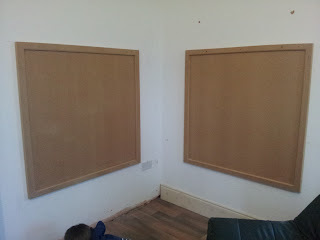 Screw to the wall and use filler to fill in the bits where the screws were drilled in. Sand everything down when these white spots are dry. 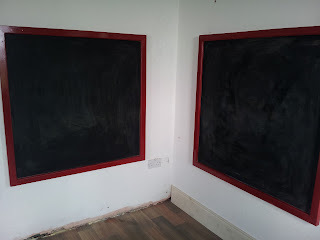 Apply blackboard paint. I painted on two coats. We opted for a nice red gloss to paint the frame. This really brings up the black. 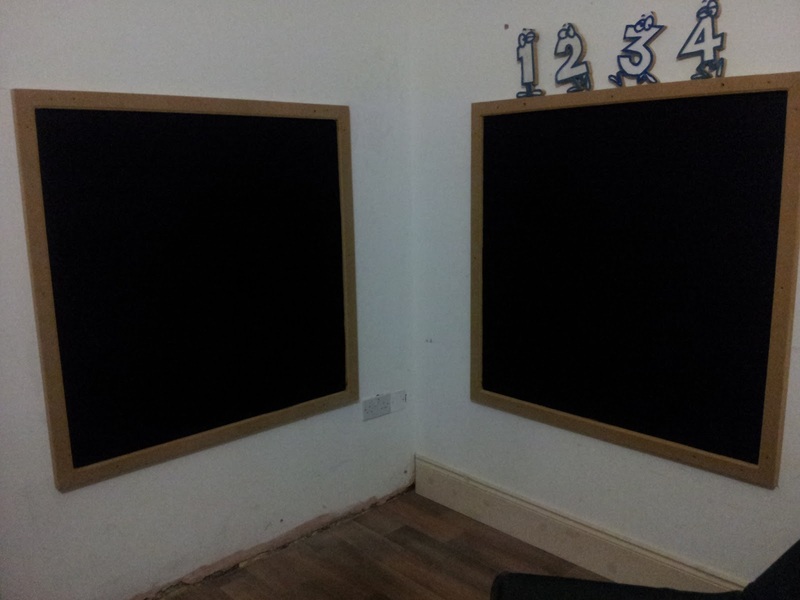 Supply your charges with a box of chalks and a duster, then stand back and watch them have the time of their life. I haven’t done it yet, but I plan on getting them some of those sidewalk chalks, you know the chalks that are as thick as your thumb. It means they won’t get lost as easily but the dog will have a great time.